Editor's note: The markets will be closed on Monday in observance of Martin Luther King, Jr. Day. Look for your next issue of DailyWealth on Tuesday after the Weekend Edition. At the store, you discover the tuna you've been buying for $4 a can is now on sale for $2. What would you do? I know what I'd do... I'd buy more cans. If I usually bought 10 cans, I could now buy 20 for the same price. I might even double my "usual" purchase and stock up on 40 cans or more. And yet... when it comes to investments, it seems like a lot of folks would rather shout at the store manager. It's especially galling with fixed-income investments... When folks see the price of interest-generating bonds and notes drop... they complain about "losing money." Here's the thing – we love sales. And for our income portfolios, we like to buy fixed-income securities to generate income. Generally, these can include funds stuffed with bonds, preferred shares, or a mix of different kinds of investments. Let's look at bond funds as an example. These are a selection of bonds that are sold in a bundle as a fund. You buy shares of the fund to get a piece of the bonds and the interest they pay. But, when a bond drops in price, its yield goes up... because the bond pays more interest relative to that lower price. So you're essentially getting more bang for your buck. And as an income hunter, you'll want to use the opportunity to buy more. Another measure we use to see if the fund is "on sale" is something called the net asset value, or NAV. Buying funds when they're trading at a discount to NAV is a fantastic strategy. We love doing this with closed-end funds. Closed-end funds issue a limited number of shares. So the share price can fluctuate based on investor demand... and not necessarily match what the securities in the fund are worth. But I love to invest in funds that are trading at a discount to NAV... It's like buying a dollar's worth of stuff for $0.80 or $0.85. In my Income Intelligence newsletter, we love looking for funds that are on sale. Whether it's a market sell-off or a discount to NAV, we scour the best investment opportunities for our readers. And after the market pullback that started in October, we're seeing several great income opportunities today. On top of that, I believe the recent downturn showed us something important – that now is the time to get defensive. In other words, this is the perfect time to pare back the risk in your portfolio and add well-selected income investments... so you can grow your wealth in 2019 with greater safety. Editor's note: For the first time in a decade, Doc is getting cautious... And he says you need to "stock up" on the right investments now to prepare for what's ahead. That's why he's hosting an urgent market briefing on Wednesday, January 23 at 8 p.m. Eastern time. If you're retired or planning to retire soon, these decisions could determine how comfortably you retire – or if you can retire at all... Save your spot right here. "Many folks pay a third – or even half – of their earnings to the government in some way or another," Doc writes. "But recently, the IRS announced that it's going to let you put away a little extra money." Read about another one of his strategies for growing your wealth right here. "Remember, when you buy a stock, you're buying an ownership stake in a company," Doc says. Learn more about one simple metric that can help you avoid the wrong businesses and pick up great bargains in stocks right here: A Simple Lesson on Selecting Winning Stocks. Goodyear Tire & Rubber (GT) is a $5 billion tire manufacturer. It sells tires under its flagship “Goodyear” brand, and it also provides auto-repair services. Goodyear’s debt load has remained well above $5 billion for the past five years. 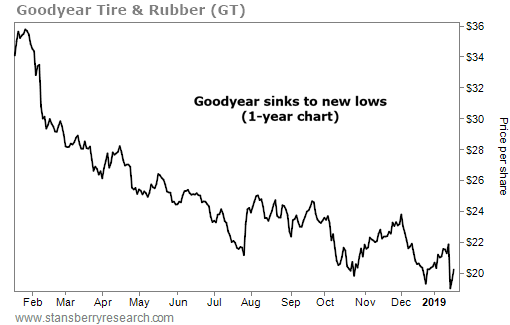 And this has hurt the company’s profits… Goodyear’s net income is expected to come in at just $620 million this year, down from $1 billion in 2016. Meanwhile, the company’s cash pile is less than half what it was in 2014… shrinking from $2 billion to less than $900 million.